The approaches and tools shown in the original entry on this page were done in a hobbiest garage-shop, using moderate level tools such as a lathe, and do not require significant machinist skills or equipment. 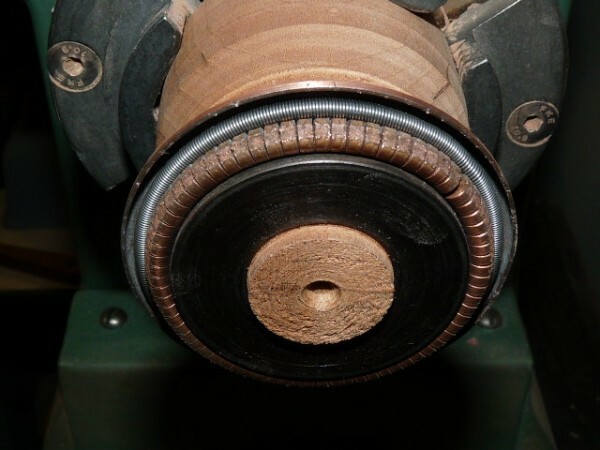 The first place to start when any repulsion-start/induction-run motor is having starting difficulties is to turn the commutator to eliminate any carbon build-up on the copper bars and to even out any imbalances or uneven surfaces. This is a fairly common procedure that only takes a few minutes with the rotor assembly mounted on a metal lathe. 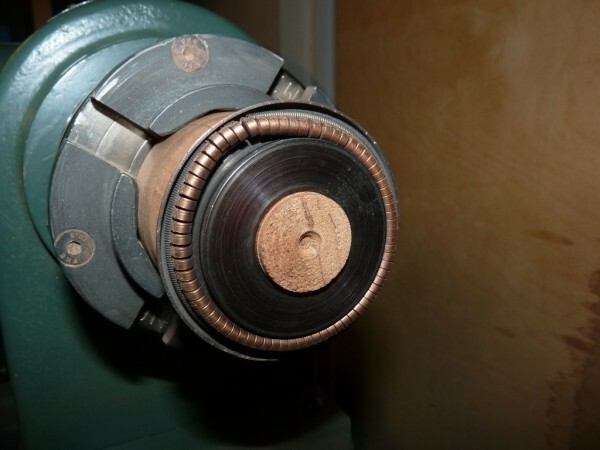 The space between the copper bars on the commutator is a softer, non-conductive material called "mica". 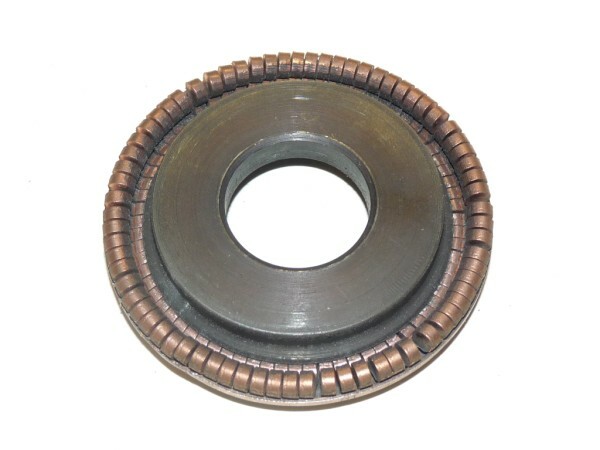 In order to ensure clean contact between carbon brush surfaces and the copper bars, the top surface of the mica should be slightly recessed below the surface of the commutator bars. 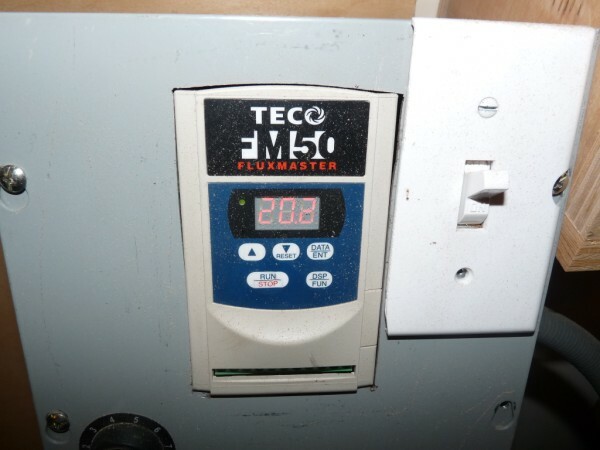 After turning the bars down, a user often needs to remove a small top layer of the mica to create that recess. This process is called undercutting the mica. 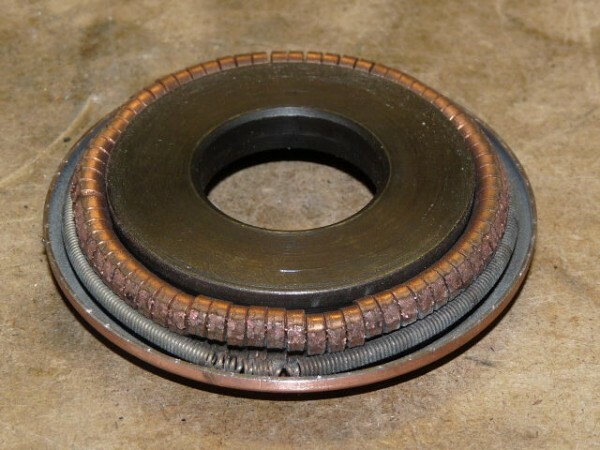 Here is the commutator end of the rotor from a 1hp RI bullet motor. 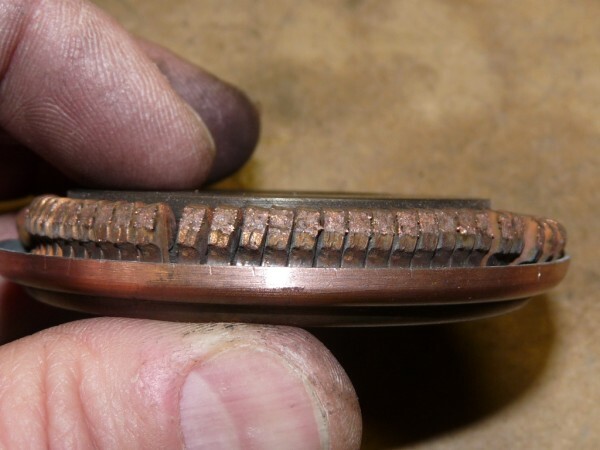 The carbon build-up on the copper surface is obvious, and it's also apparent that the commutator has been turned down several times over the many years. 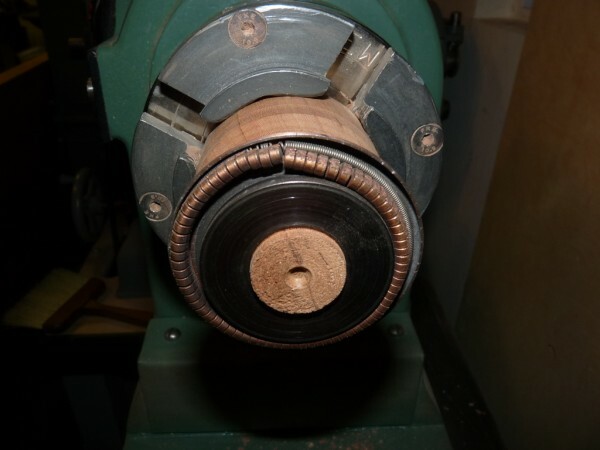 After spending a few minutes on the lathe turning the commutator, it is much cleaner and smoother. However, in this instance, the surface of the mica has also become essentially flush with the top of the bars. Depending on the size of the gap, you can use a small blade and hand cut the grooves lengthwise. 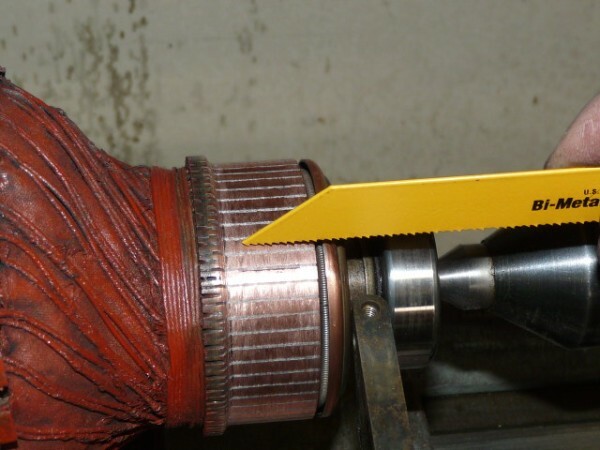 In this case, the photo below shows using the tip of a metal blade from a reciprocating saw. The tip of a hacksaw blade can also be used effectively for the same purpose. 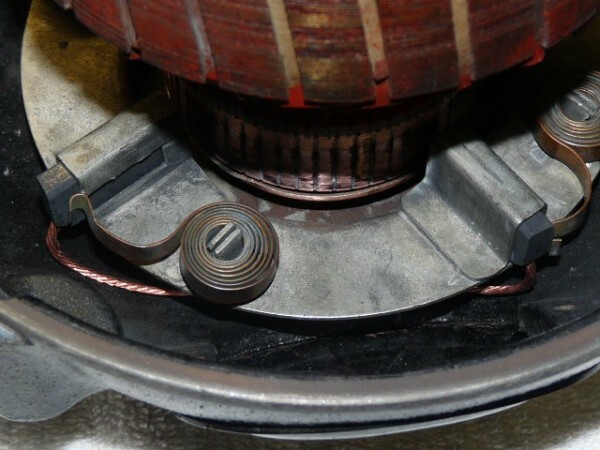 Once done, the commutator looks far better than it did half an hour earlier. 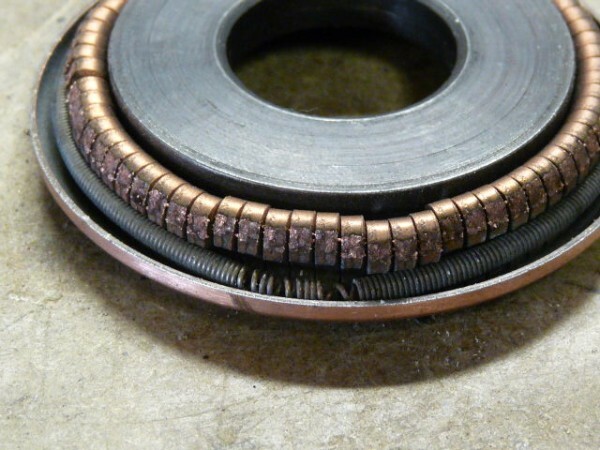 The "shorting necklace" is a circular spring, sometimes called a garter spring, inside the commutator, and is often one of the most common failure points on a Unisaw RI bullet motor. 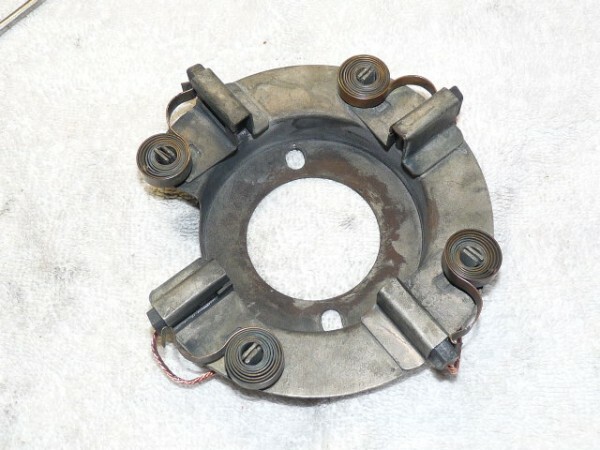 It is also one of the most troublesome parts to locate for replacement. 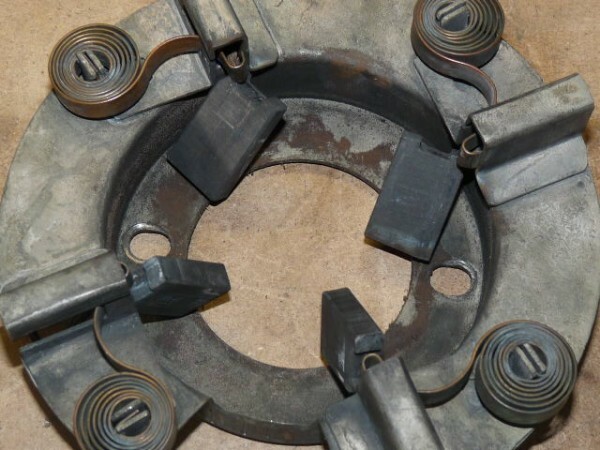 The following discussion shows how to remove the shorting necklace, assess its condition, and one way to fabricate a new shorting necklace from aftermarket extension spring stock. 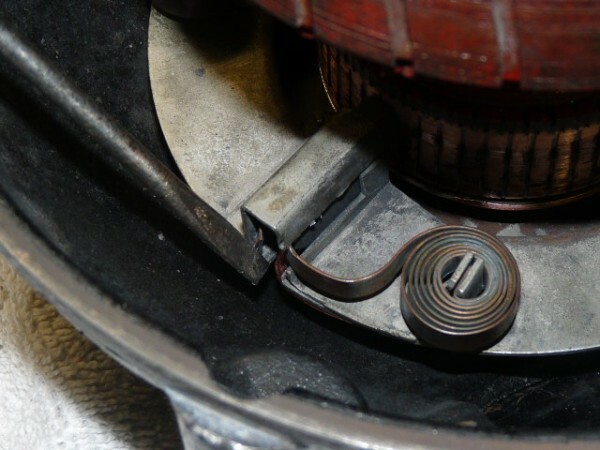 Start by removing the bearing on the commutator end of the rotor assembly. Behind the bearing, the necklace and contact ring assembly is held in place by a very strong and tight snap ring. There may be different designs of the snap ring, but regardless, this part is often difficult to remove due to its awkward location and its tension. 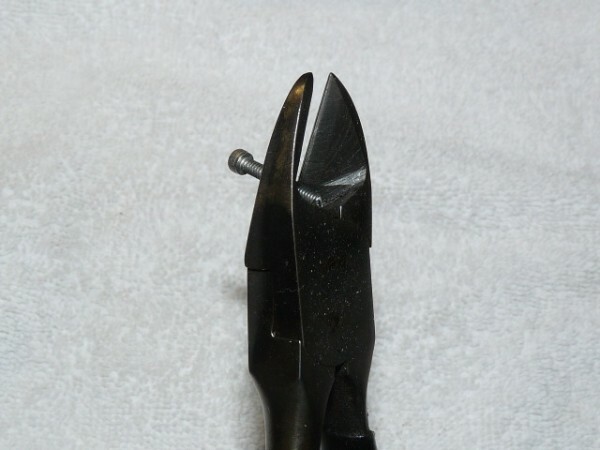 A pair of snap-ring pliers are an almost essential hand tool needed to get the ring loosened from its anchor groove. Use caution when trying to pry it out with items such as screwdrivers, picks, or punches, as you may damage the part or perhaps even injure yourself if it slips. Once the snap ring is removed, the contacts and necklace assembly slips off easily. In this case, it is apparent that this "spring has sprung", as seen by the deformed section of the necklace where it has lost its strength to hold the contacts tight together, or "closed." The next three photos show what the contacts look like without the spring, and how they should be positioned respectively when closed and open. 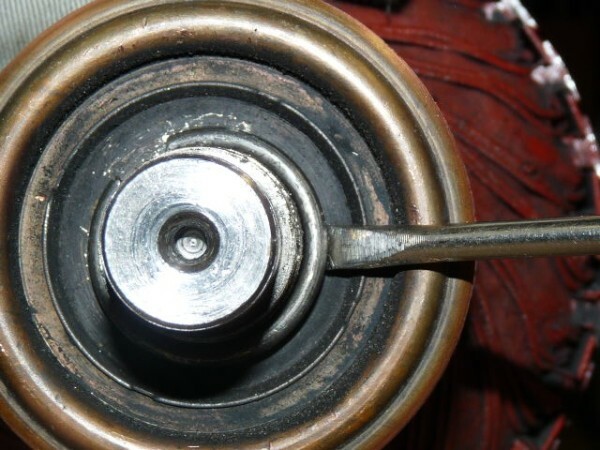 Given what looks to be a damaged necklace, one may want to test the spring and contacts to see whether they are properly "throwing out" to open the contacts as the motor spins up. Premature opening of the contacts may cause the motor to try to shift into induction run mode too soon. 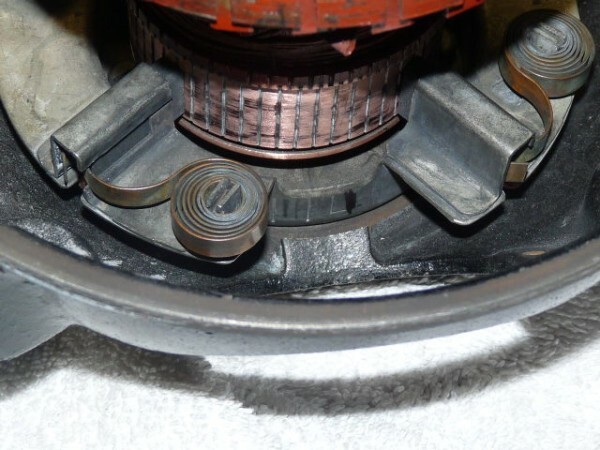 More importantly, a non-smooth or inconsistent opening may cause the motor to have a conflict between the respective repulsion start and the induction run modes. In other words, it is important that the ring open in one smooth and consistent motion so that the switch between modes can be made quickly and completely. 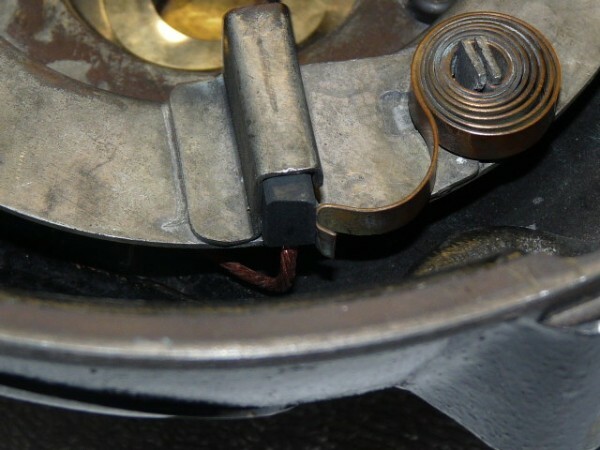 While many users may not be able or interested in running a speed test, this section shows how a bad necklace can throw out improperly and one way of testing the RPMs at which the spring releases to open the contacts. 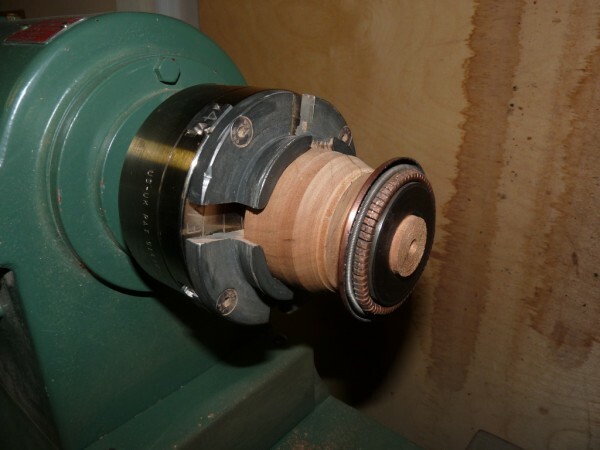 The contact/necklace assembly was mounted on a stub mandrel that could be chucked into a wood lathe scroll chuck. 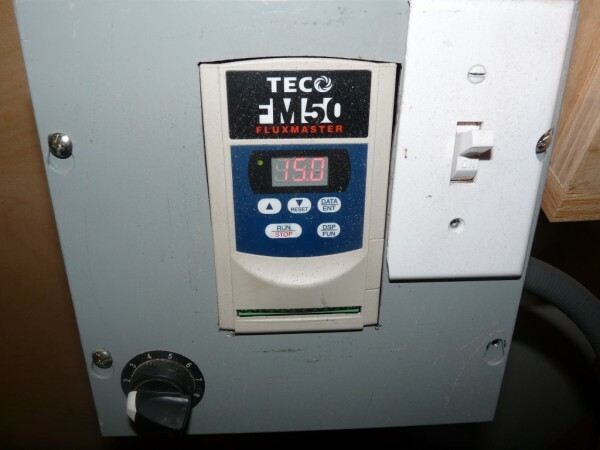 The lathe is a three-phase lathe powered by a VFD with a digital read-out of the frequency. 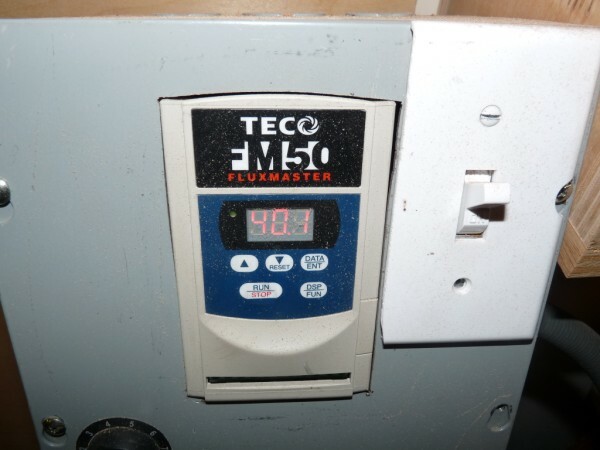 The manual lathe speed was set to 1500 RPMs at full speed, i.e., 60hz on the VFD. 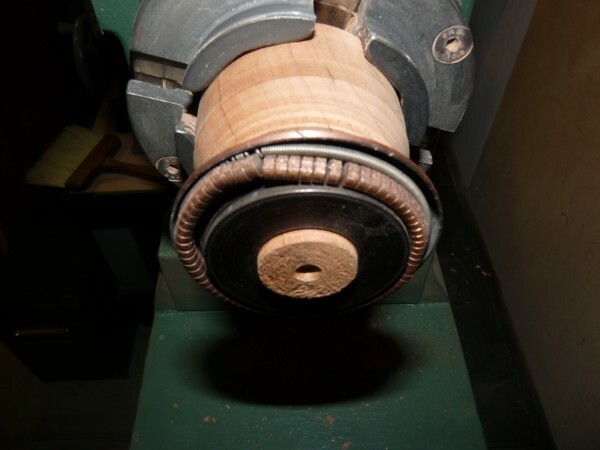 Note that the following photos are taken with the lathe spinning at the speed noted, with the camera able to capture a clear single frame of the spinning chuck/assembly. At a low speed of 375 RPM (15/60hz at 1500rpm), the spring can be seen to already to be losing a hold on keeping the contacts closed. More importantly, it is apparent that the premature throwout is located precisely at the point of the spring damage. 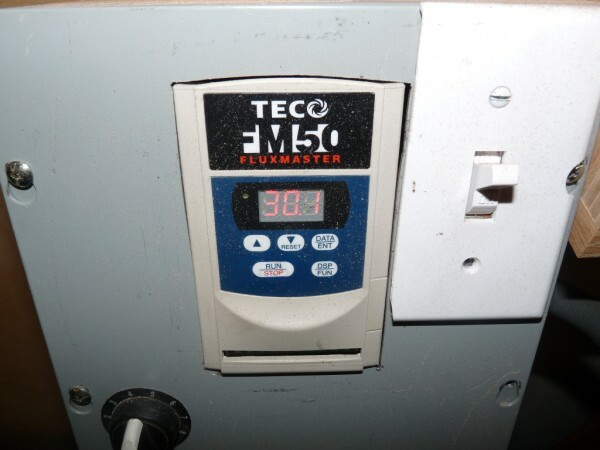 At 500 RPM (20/60hz), the inconsistent throwout continues and is definitely at the point of the damaged spring. At 750, the inconsistent throwout continues, but expands. Finally, at 1000 RPM, the spring/contacts have fully thrown out. So now there is pretty clear evidence that the old, damaged shorting necklace is causing problems for the motor switching from repulsion start mode to induction run mode during start-up. That also means the necklace needs to be replaced; unfortunately, they also are not typically available as an aftermarket item. However, it is possible to fabricate a usable new necklace using purchased small extension spring stock. First, it is necessary to measure the length of the spring. As a first thought, one might consider simply using measures of the original damaged necklace. Obviously, the easiest way to measure it would be to simply cut it and lay it straight to measure. But sometimes it may be worth measuring it intact as a circle, perhaps to save it for emergency use later or to compare the new one against as a final check on correct size. Note that different motors have commutators of different size, so the dimensions shown here may not be correct for a given motor. The diameter of this one that's being replaced is about 2.5", which, using basic algebra (pi * diameter), suggests the circumference/length should be just under 8". However, old springs can tend to be stretched or the damaged portion can be misleading. So other, more precise methods are probably preferred. 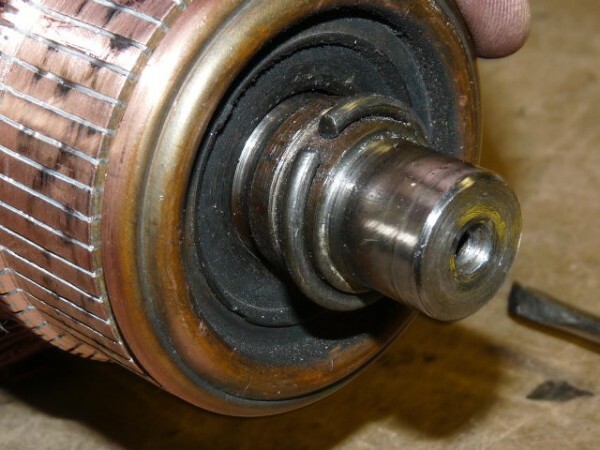 The following paragraph about springs and lengths was extracted from a post on the www.owwm.org forum site where this particular motor rebuild was discussed (http://www.owwm.org/viewtopic.php?f=82&t=107557). Now it seems to me everyone is wondering exactly how long to cut the spring. Some have used the old spring as a model and tried to guesstimate how long it originally was. I found this probably won't get you close, especially if your spring is badly deformed. So I approached this a bit differently. First one must understand how a spring works. Take any spring and unwind it and you have a straight wire. 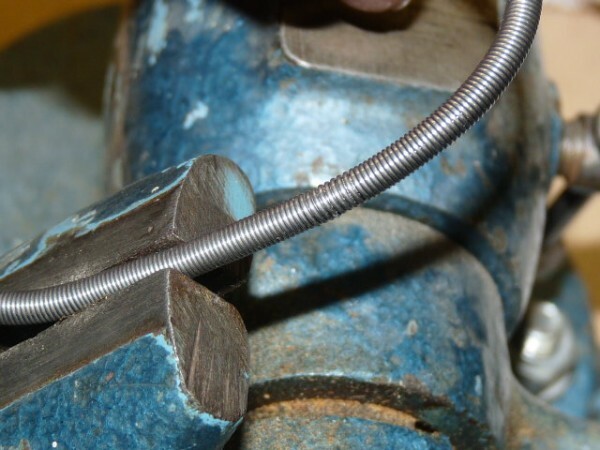 If you clamp one end of the wire in a vise and grab the other end with pliers and twist it, you will find there is certain amount of rotational force you apply before the wire breaks. There is also a certain amount of force that can be applied and released and the wire returns to its' original form. This is what makes it a spring...the ability to return to a set configuration after being deformed. And the amount of force required to twist the wire is dependent upon the diameter and length of the wire. You might be able to "twist" a 1 foot section of wire half a turn ,and 10 feet,5 or 6 turns. It all depends on the material being used and how "springy" it is. Now wrap the wire into a series of coils and you have a spring. So understanding those parameters I decided the only way to accurately reproduce the spring was to count the coils. As this is a close wound spring the coils all touch the next. After a slow, laborious process, I arrived at the figure of 319. It is agreed the spring wire diameter is .018. So 319 x .018 = 5.742. In comparing this length with the original it appeared way too short. (The old spring was more than 1 inch longer). To verify my math, I measured 1 inch of the new spring which is 55 coils. And doing the math that way I came up with 5.8 inches. So to be reasonable and at least find a starting point, I settled on 5.75 inches of spring. Before that post was added to the forum thread, I first made a spring using the estimated length as noted above. 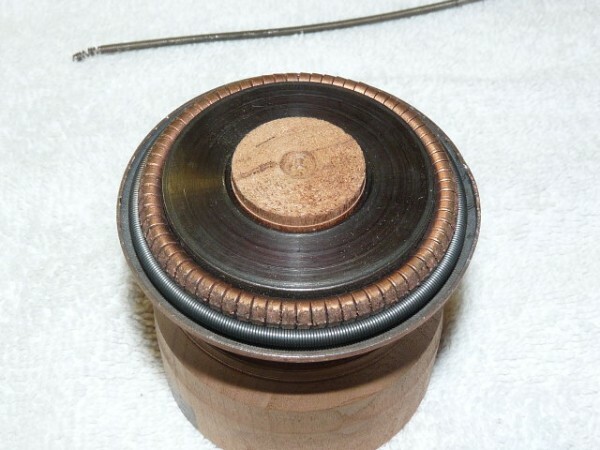 The original OEM necklace is made out of an extension spring, using 3/32 .018 wire. 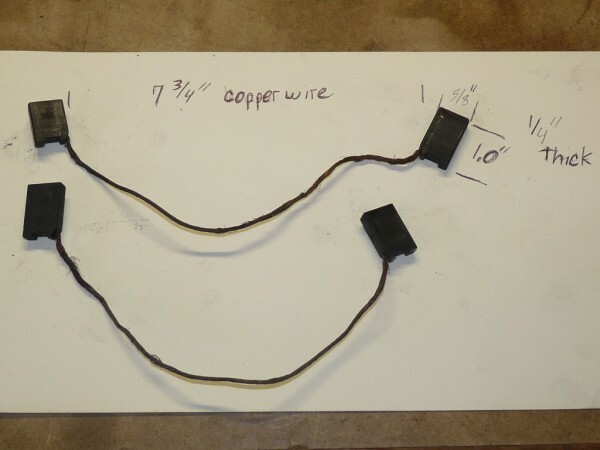 That specific wire can be hard to find, but a very close approximation is a 1/8 .018 wire that is available from on-line sources such as McMaster-Carr (www.mcmaster.com, this example was $4.00 plus s/h for a 36" length). 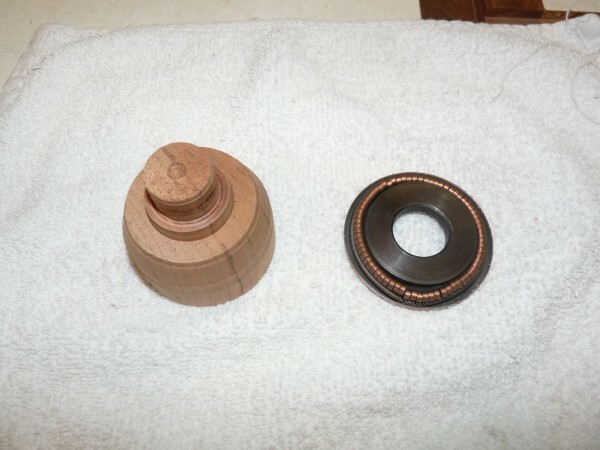 The 1/32 difference in outside diameter (OD) should not matter for purposes of this part. Because the old spring was deformed and stretched, the new first piece that was cut for this project was about 1/2" shorter total length (7.5") than the original spring. 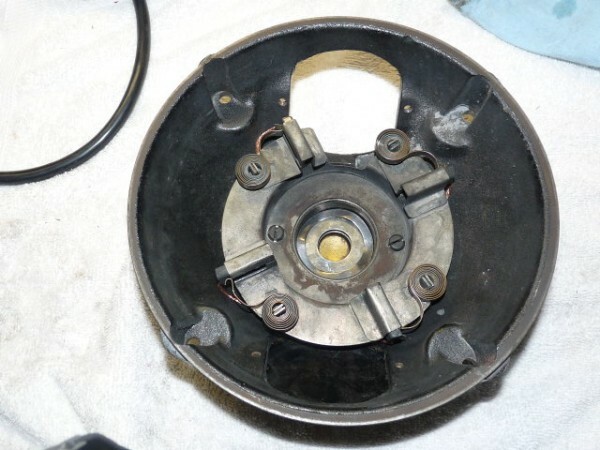 After completing the spring (described below) and reassembling the motor, however, the motor was inconsistent on start-up. Sometimes it fired right up, other times it growled, grumbled and just threw sparks. Eventually, it became apparent that perhaps the new 7.5" spring was too long, concluded in large part thanks to the efforts of the person who posted the technical information about how a spring works and how its true length can be determined. So this motor was taken back apart again to make a shorter spring. 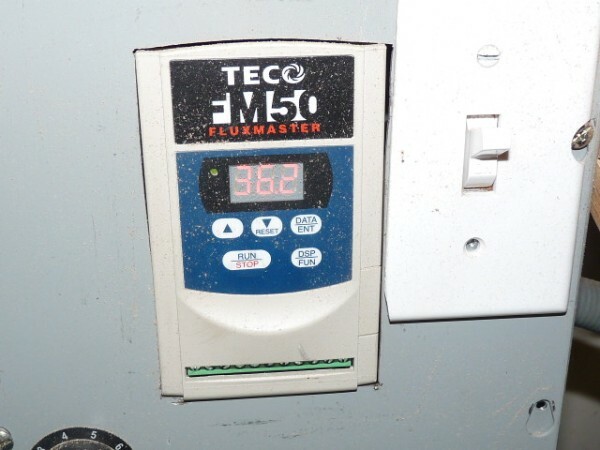 The number of coils on the damaged OEM coils were counted, and arrived at a similar number of coils per inch and a similar number of 325 total coils. Using that reference for confirmation, I created another, smaller, new spring that was 6" long. Here you can see the two new springs, the original at 7.5" and the smaller one at 6". 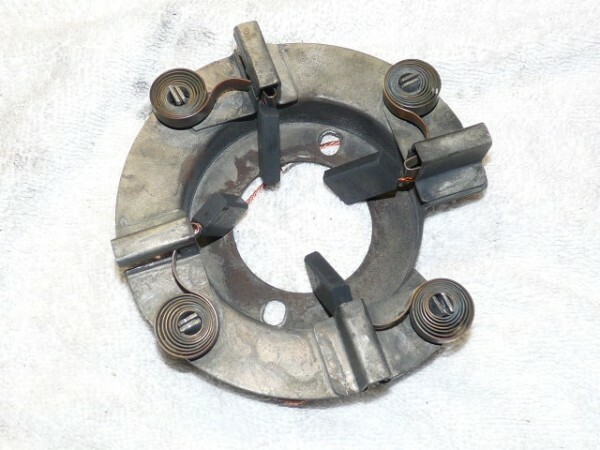 Once reassembled with the new smaller spring, the motor consistently started time after time, both with and without a blade or other load installed. 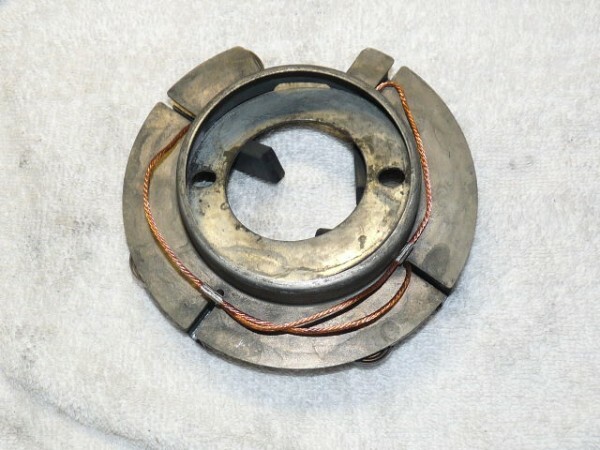 RECOMMENDATION: A SPRING LENGTH OF 6" +/- .25" IS SUGGESTED TO AVOID A SPRING THAT THROWS OUT TOO SOON AT AN RPM THAT IS TOO SLOW FOR THE RUN WINDINGS TO KICK IN CONSISTENTLY. 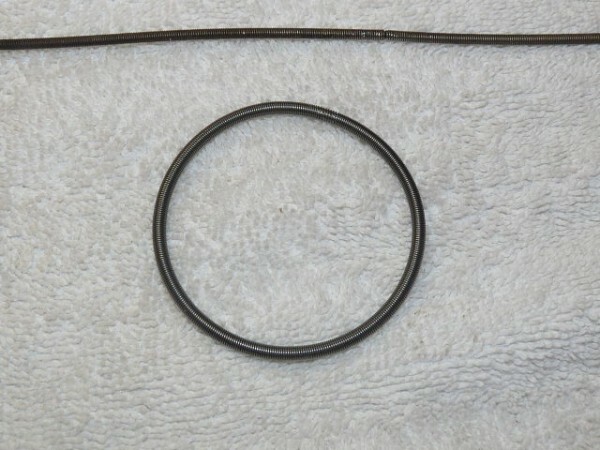 One of biggest challenges in making a new spring is figuring out how to connect the two ends solidly, without distorting the ring or adding significant weight through a blob of solder, etc. The original necklaces were intertwined with one end twisted tightly inside the other end. Try as you might, though, that is a real challenge to do by hand. 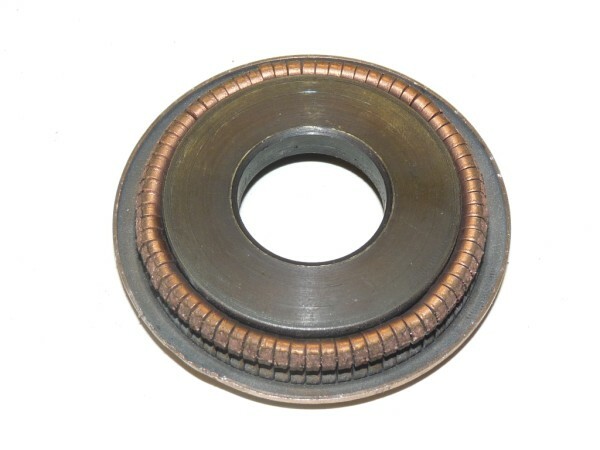 An alternative is to use a tiny connecting stud that threads inside the two ends of the spring. 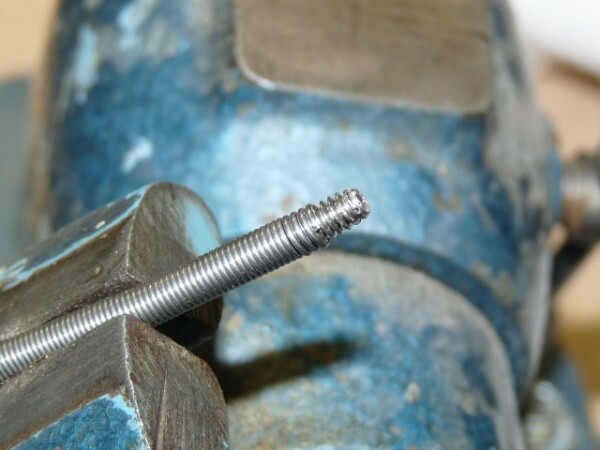 A 6-32 machine screw happens to fit almost perfectly inside the threads of the 1/8 .018 wire. 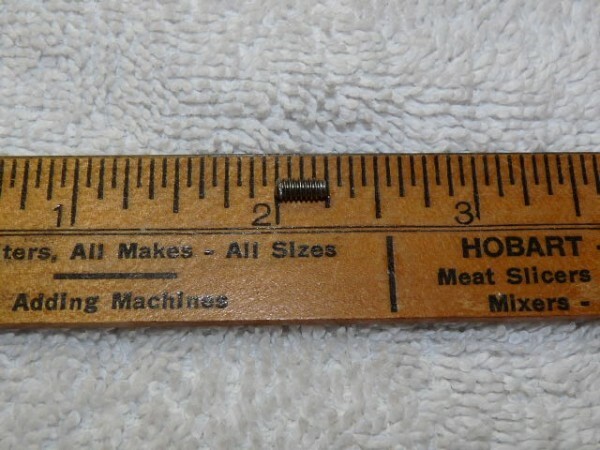 Take a 6-32 machine screw, count up eight threads from the end, and cut it off, leaving a 1/4" miniature allthread stud. Clamp one end of the spring in a vise to get access to the end. Thread the stud halfway (about four threads) into the end of the spring. Then take the other end of the spring, which will form a loop, to prepare for the connection. Twist the open end four rotations in the direction opposite of the threading, so that there will be no rotational tension on the spring after it is installed, and thread it onto the remaining section of the threaded stud. It may be surprisingly easy, and also will be a surprisingly strong bond as the stud threads work their way between the coils of the spring. Once done, a drop of locktite may be added to seal the bond between the parts. The joint becomes almost invisible. 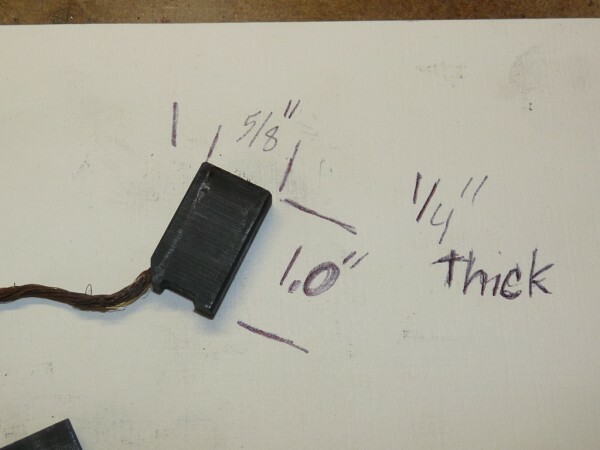 NOTE: THE FOLLOWING SECTION WAS POSTED USING DATA FROM THE ORIGINAL 7.5" LONG SPRING THAT HAD INCONSISTENT STARTING. IT IS RETAINED HERE FOR PURPOSES OF SHOWING THE TESTING METHOD AND IMPROVED CONSISTENCY OF A NON-DAMAGED SPRING. THE NEW 6" SPRING RUN THROUGH SIMILAR TESTS SHOWED A VERY CONSISTENT THROWOUT PERFORMANCE AT 1250 RPM, CLOSE TO 75% OF FULL MOTOR SPEED. FEEDBACK RECEIVED SINCE THE ORIGINAL DISCUSSION SUGGESTS THAT'S A MUCH BETTER TARGET SPEED. 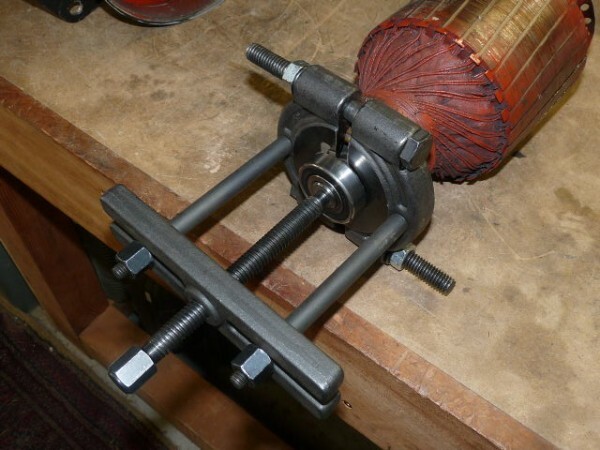 Now it's possible to test the new spring on the lathe jig that was developed earlier. The spring looks good when mounted, as the contacts appear to be held closed consistently. 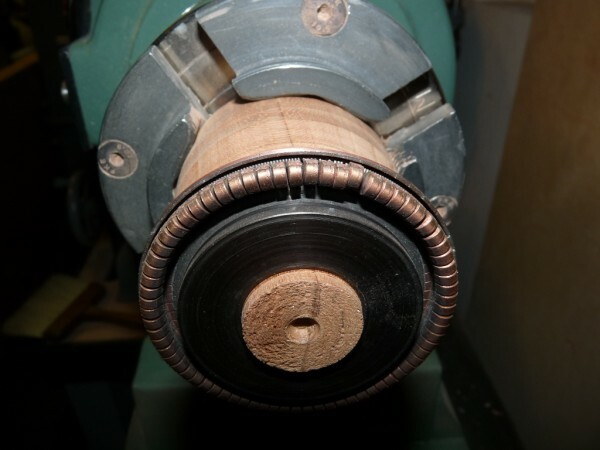 At 625 RPM, the ring still holds the contacts closed (again, photos taken with the lathe spinning at speeds noted). At 900 RPM, the contacts throw out smoothly and consistently around the perimeter. Running the speed control up and down several times, the opening and closing of the contact is very consistent with both an audible "click" and a visual evidence that it moves in and out smoothly. All is well, and it seems that the new shorting necklace is done and ready to go to work. Finally, one last step and set of parts that may need attention in working on a Unisaw RI bullet motor are the carbon brushes that engage with the commutator. 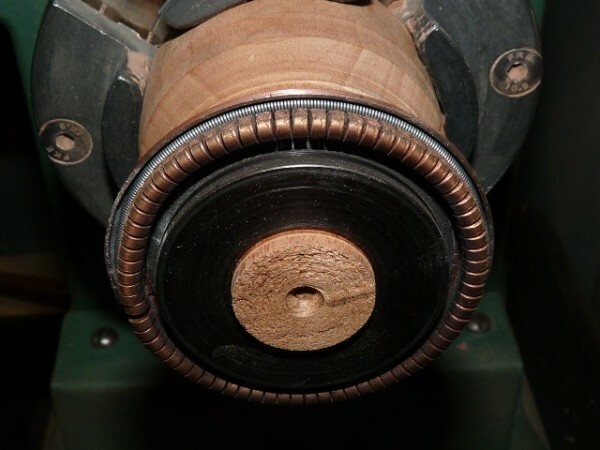 Motors that run at 1725 RPM typically have four brushes installed at 90-degree intervals around the perimeter. 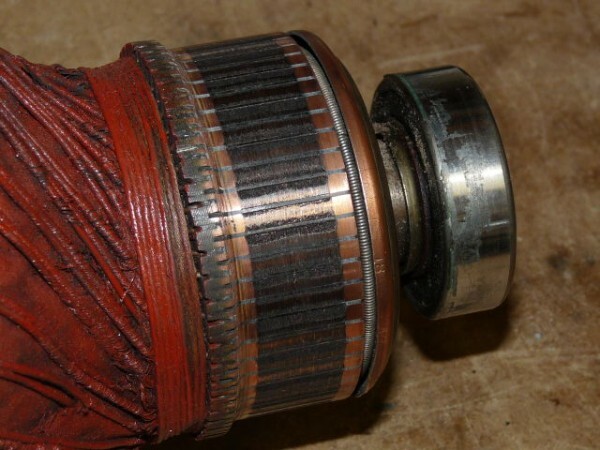 3450 motors have only two brushes, located on opposing sides of the commutator. 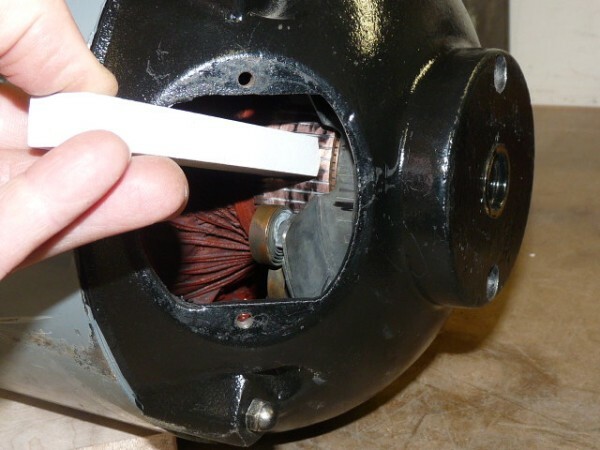 The motor shown here is a 1725 model with four brushes. 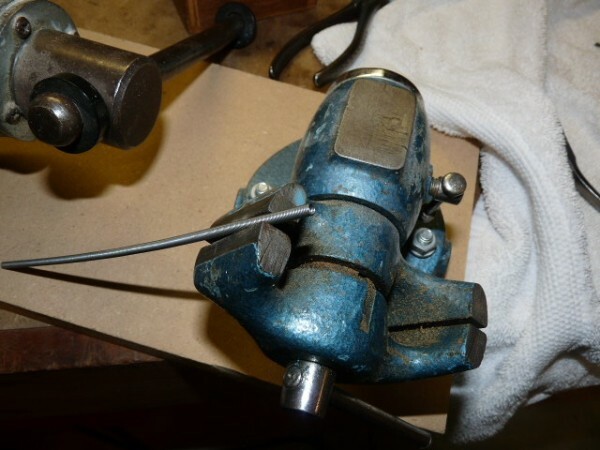 The old brush ring is unbolted from the motor endbell and laid on the workbench. 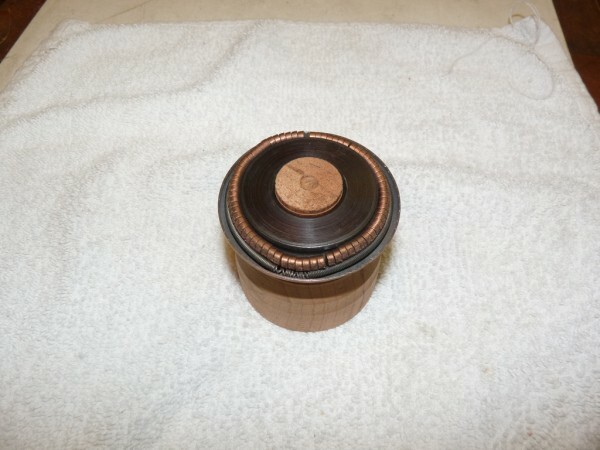 The brushes will be pushed out of their retaining slots by the coil springs. 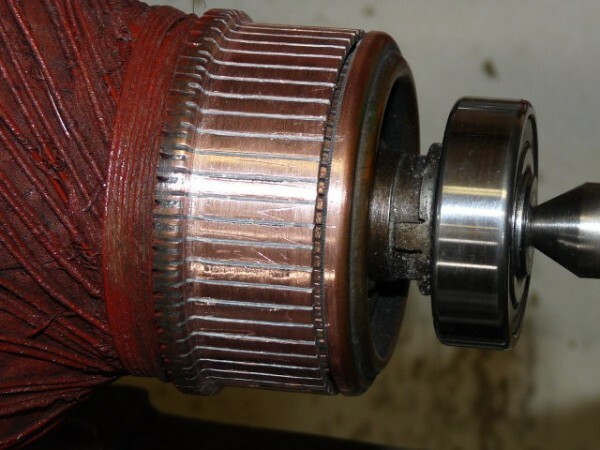 The brushes themselves are created in pairs, connected by a copper wire, with pairs installed on opposing sides of the brush holding ring. It can be seen in this example that the brushes have been worn down unevenly over the years, with one significantly shorter than another. 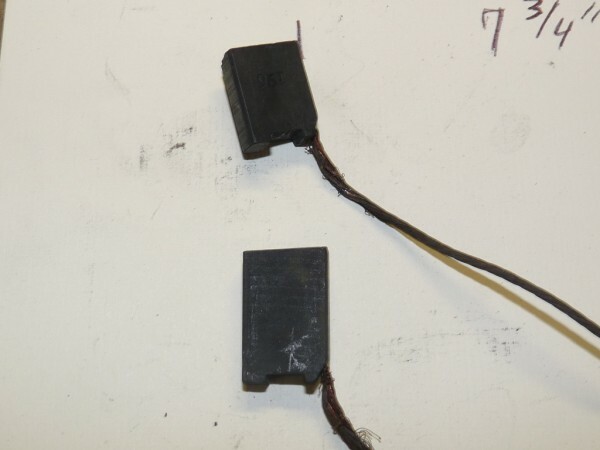 In addition, there is some fraying of the wires that connect the pairs. Dimensions of the brushes can be seen in the following photos: 1" long, 5/8" wide, 1/4" thick, connected by a wire ~7 3/4" long. New brushes can be found on-line and are not particularly expensive. This new pair was found at Eurton Electric (www.eurtonelectric.com) for $25 plus s/h. 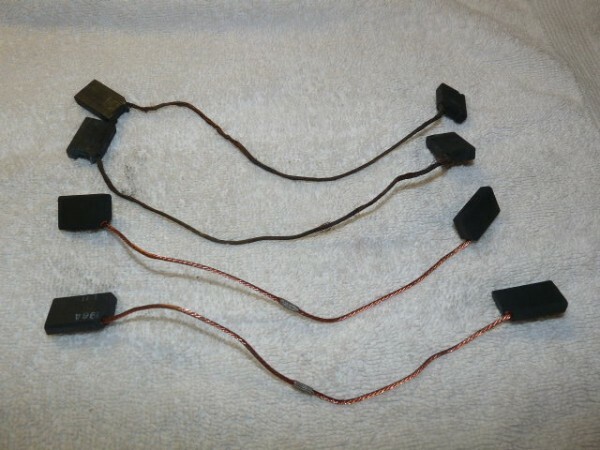 These are called "Brushes with wire and connected in pairs, no terminals." When I did this project in 2012, they were found at this page on the Eurton Electric website: http://store.eurtonelectric.com/brushesfloorequipment196a-2.aspx. They certainly look better than the old ones. Installing the new brushes is pretty straightforward, with the pairs stretched around the outside of the base to opposing brush holders. 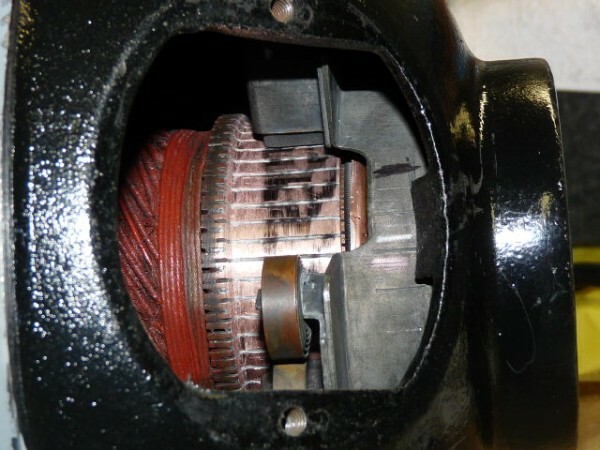 Users have commented that their motors have the brush pairs installed in 90-degree slots rather than overlapping as in this example. The best suggestion is probably to reinstall new brushes in the same orientation that were used for the old ones. These are new brushes installed in the brush ring. It looks about the same front and back as the old ones. Note the wiring location on the back side of the ring. 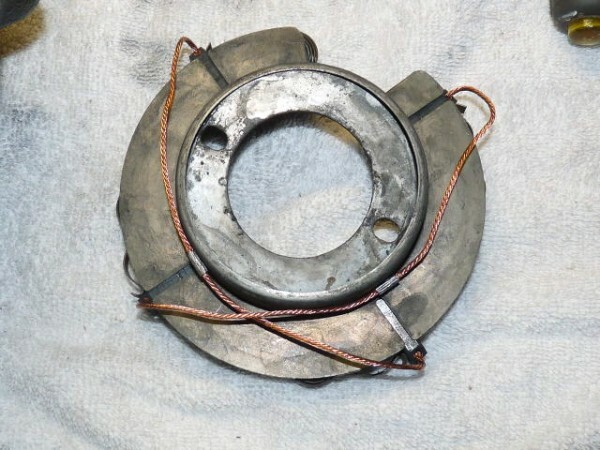 1) Be sure that they are wrapped around the side that does not have the opening in the cover flange -- that is where the adjustments will be done after reassembly, so the wires should not be placed there, where they will interfere. 2) Make sure they sit flat on the plate, so that they don't get caught under the assembly when it is flipped upside-down and reinstalled in the endbell. For ease of reinstallation, the brushes can be held in a retracted position by the coil spring. Now the ring can be flipped upside-down and reinstalled into the endbell casting. 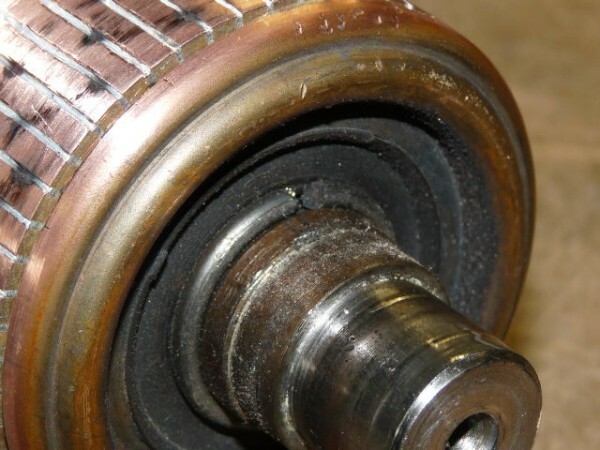 At this point, the rotor with the bearing reinstalled can be seated into the bearing well, inside the brush ring. 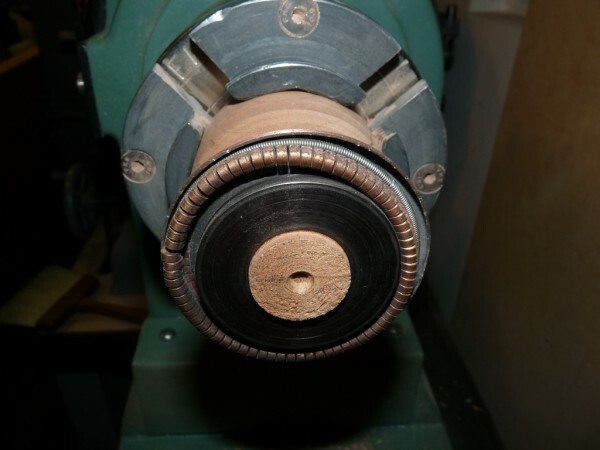 Then the coil springs can be released to exert pressure against the brushes and push them against the commutator. 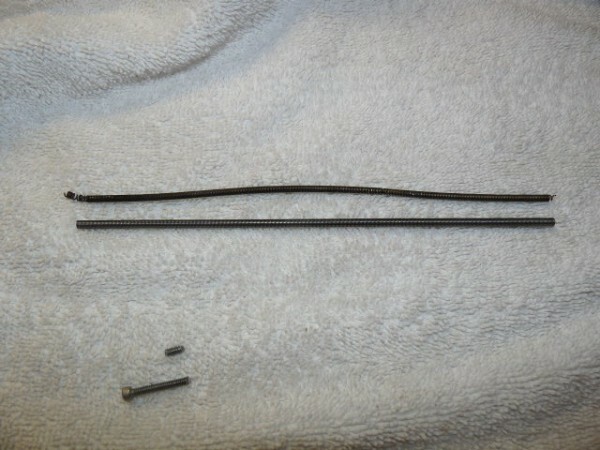 In the second photo below, note the screwdriver behind the spring. Be sure to confirm that the wires are not bound up underneath the brush ring plate and that every brush slides freely within its respective sleeve. 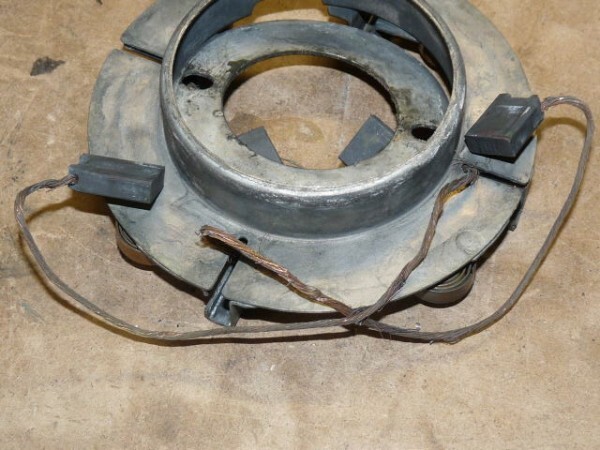 A wire can get hung up on the lip of the plate and prevent efficient brush performance on start-up. At this point, it's time to reassemble the motor as a whole and do the final tune up. 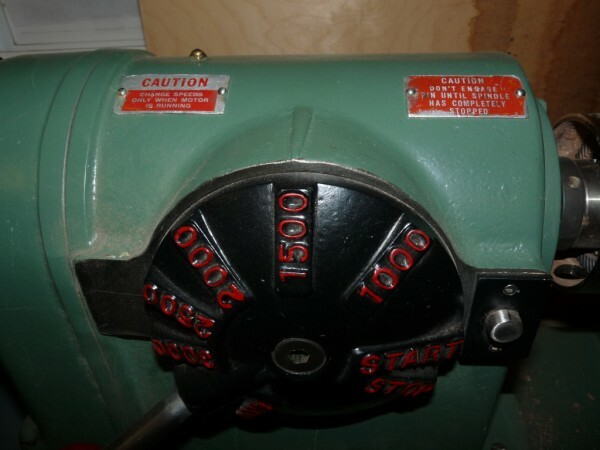 The opening in the brush ring should be visible through one of the ports in the end bell, with the "R" and "L" visible to show the relative reversing positions for start-up. 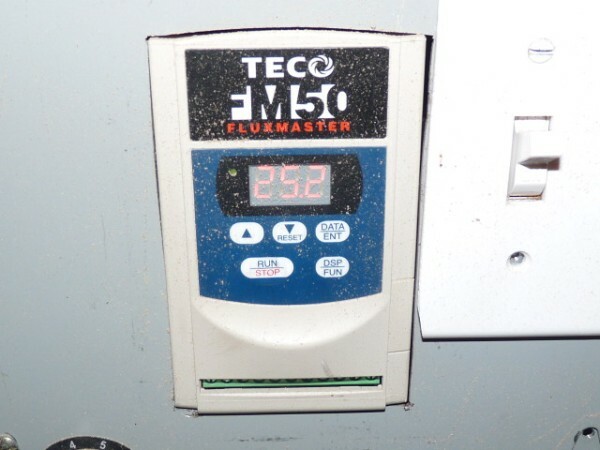 It is inevitable that some trial and error will be required to fine-tune the motor for optimal start-up. In the photo below, the positions of the OLD orientation are seen in the felt-tip pin markings, which did not transfer exactly to the orientation after this repair. Instead, after a dozen or more very minor adjustments, this motor's new "best" alignment was located and identified by the pencil mark that is matched to the middle of the alignment bracket. 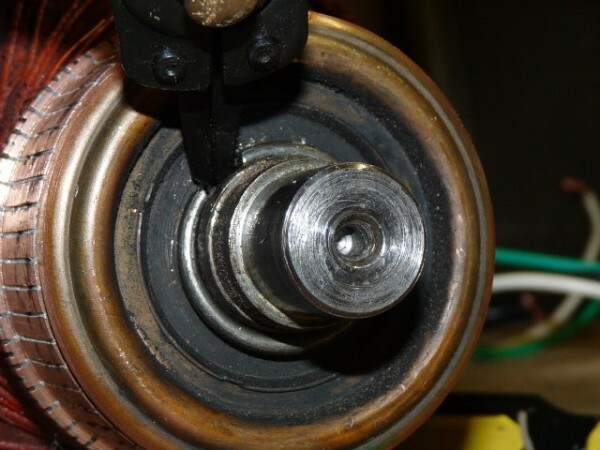 Finally, a commutator "seasoning stick", again available on-line from sources like McMaster-Carr, should be applied against the commutator while running to smooth out surface imperfections in the brass bars and help seat the brushes solidly against the commutator. To help with the initial alignment and set-up on this motor, the comm stick had been applied while the rotor was mounted on the metal lathe, and it was then used again as the final step shown below with the motor fully assembled. Hopefully, this Unisaw RI bullet motor page will be useful to others who encounter difficulties with these old, but very nice motors. Best of luck to anyone who attempts to work on such a motor, it is well worth the effort once done successfully.